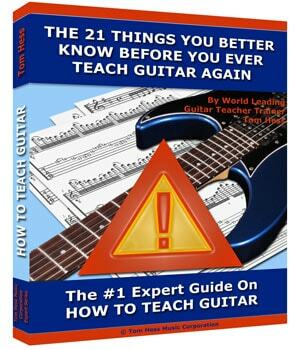 94% of guitar teachers in the United States have not even read a book on how to teach guitar. 95% of all electric guitar teachers in the USA have no formal training, coaching or mentoring on the subject of how to teach guitar! 96% of all electric guitar teachers in the USA report that they have not reached their financial goals as guitar teachers. ….and now you know why a small percentage of guitar teachers are experts and totally dominate the competing guitar teachers in their city/local area. The proactive guitar teachers who seek out coaching are the teachers who are typically in demand. The other 95% of guitar teachers without training often struggle with different areas of their guitar teaching and their overall guitar teaching business, often just barely making enough money to make ends meet. Fact is, getting trained on how to teach guitar is not only in your own best interest, but it is also your very first ethical responsibility to your students to be the best teacher you can be. You sure don't want to be one of the losers who advertise oneself as a real 'guitar teacher' who takes money from students but isn't qualified to really be teaching anyone. 1. You need to learn many things that you probably don’t yet know so that you can quickly become a much more effective guitar teacher, help your students progress faster, and ultimately earn more money. 2. You need to ‘unlearn’ many common but ineffective, sloppy or just downright wrong ways of teaching guitar. Sadly, most guitar teachers teaching in the ways of ‘conventional wisdom’ get very poor results. You already know this, simply think about all the students the common guitar teacher has taught… but those same students STILL cannot play guitar well! Sure, some students don’t put in the time and effort required to improve, but many do and yet their progress is not very good. One can only blame the teacher’s failed conventional wisdom methods for these lame results, frustration and a collection of guitar students who never make it to the advanced levels. 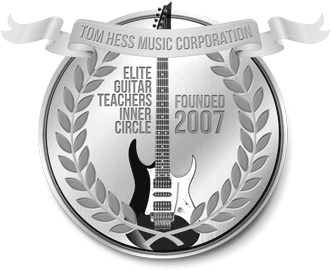 Before becoming the leading guitar teacher on the internet I invested nearly two decades teaching tens of thousands of guitar lessons in music schools and in an Illinois college - developing, testing and refining the very best guitar teaching methods and practices. Since 2006 I've been coaching, training and mentoring guitar teachers from around the world to become not only top guitar teachers, but also to start, grow and run their own highly successful 6-figure income guitar teaching businesses. For years guitar teachers have asked me specific questions about how to teach this, or how to teach that. So I decided to develop an eCourse for guitar teachers like you to get the answers to these (and other) questions answered in detail so that you get the insights, knowledge and training that you need to become a great guitar teacher who can attract more students, teach them better, keep them longer and make a lot more money in the process. How and what to teach intermediate guitar students. Many guitar teachers look for one specific method to teach their intermediate guitar students. This is the exact WRONG approach to teaching intermediate students. Learn how to do it right, so your students don't quit on you. How and what to teach beginning guitar students. Beginning guitar students are BY FAR the most difficult type of student to teach correctly and effectively. Fact is, average guitar teachers (you know, the ones who have no real training teaching guitar, but think they know it all) lose most of their beginner students within the first few months of lessons because those teachers simply do NOT know how to teach beginners correctly. How to balance giving guitar students what they want with giving them what they need. You must learn to do both at the same time. The trick is to understand how to do that for each specific student type. A one-size-fits-all approach will definitely not work here. Learn to get this right and you'll have a lot of very talented, happy and loyal students for a very long time. What you should do if you don’t know what to teach someone. There will be many times when you don't know what you should teach a student next. 'Not knowing' is ok, the problem is that the vast majority of teachers deal with the problem in all the wrong ways - or worse, they don't even try to deal with it and they just 'wing it' because they are too lazy or arrogant to get the training they need to solve this reoccurring problem once and for all. If, when and how to start teaching guitar students to read music. There are 3 main things you need to know: 1. If you should teach a particular student to read music notation, 2. When to begin (or continue) to teach this and 3. How to teach it in the best way possible. How to inspire and motivate your guitar students to practice. You can give your guitar students the best possible lesson materials, you can use the best guitar teaching methods, you can teach your students with the best explanations, demonstrations and guidance, but until and unless you teach, train and coach your students how to practice the guitar, none of the other stuff matters... their improvement as a guitar player will be slow, difficult and frustrating. Learn how to teach, inspire and motivate them to better, longer and more often and your job (and their improvement) will become much easier. When to teach guitar scales and modes. Obviously teaching scales and modes is very important for the vast majority of guitar students to learn. However, 'when' to teach this in the student's musical development makes a big difference in how well your student will learn to apply and integrate this knowledge with other skills and knowledge he already has (or will have in the future). If you teach this too early or too late, you'll run into problems with many guitar students… timing is important. How to teach guitar scales and modes. How many times have you heard other people say this cliché: ‘scales are boring’? Truth is, scales and modes are absolutely NOT boring, but THE WAY many guitar teachers TEACH scales and modes would even put me to sleep (and I love scales and modes :) Learn how to teach this correctly and you won't be hearing students telling you how boring scales and modes are. When and how to teach music theory. Some guitar teachers teach music theory too early, others teach it too late. The trick in learning how to teach music theory to guitar players is to not teach music theory in a linear way. Almost all books, classes, courses etc. teach music theory in a linear way and the result is not good for most guitar students (as you already know!!) How many times have you heard guitar students complain that music theory is boring? Now you know why they feel that way. Music theory is actually very interesting, but how and when it's taught will make the difference between guitar students loving it, hating it or feeling indifferent. I'll show you what to do in order to make your students enjoy the process of learning music theory, get them to really understand it and apply it. When is the best time to teach guitar students to apply what they have learned to real music. Most guitar students learn a bunch of 'stuff' but are never really taught how to apply any of it to real music. Not only should all guitar teachers be focused on helping their students apply what they learn but the timing of 'when' to teach this is of critical importance. I'll show when to do this and how to go about it. How to teach guitar chords and chord changes. It's not enough to say to a student, "here is a D chord, here's where to put your fingers, go home and practice this every day." That is NOT teaching at all. Yet that's what most guitar teachers do and it's the reason why students take weeks or months to master very simple chords that they should be learning and mastering in a few short days!!! I'll teach you how to teach chords and chord changes the right way for better, faster and easier results. When to teach improvising. You probably already know that teaching your guitar students to improvise melodies and lead guitar solos is an absolutely critical aspect of teaching guitar to most students. However, most guitar teachers wait way too long before starting to teach improvisation and when they finally do, don't teach it effectively. I will show you what to do to enable your students to become great musicians and have fun improvising. How to teach improvising. Teaching improvisation well requires a lot more know-how than simply showing students which scales, arpeggios and chords fit together or showing them how to incorporate licks over chord progressions. I'll show you important and little known elements of how to teach improvisation well. Whether you should teach guitar students in group classes or not. Teaching group classes may sound scary to you if you are just starting out and it even is for more experienced teachers but fact is, there is no reason for you to be nervous about teaching guitar students in group classes. Learn why mediocre guitar teachers falsely think that teaching group classes is worse than private guitar lessons and why they are essential to your success as a guitar teacher and your students' musical development. How to teach guitar students in group classes. Teaching group classes is one of the most important aspects of teaching guitar because the things that can be learned in a group can never be learned in a private lesson. Most teachers don't know how to teach group guitar classes effectively and struggle to teach people of different skill levels and knowledge levels at the same time in the same class. This leads to teachers either giving up on group classes or only teaching beginner classes, both are enormous mistakes. I'll show you exactly what to do in order to teach any group class to virtually any mixture of students with different skill sets and backgrounds AND how you provide massive value to them all. This alone is worth 10 times the amount money you will invest in this awesome guitar teaching eCourse. How to help your guitar students progress FASTER. There are 7 primary elements to helping your guitar students progress fast. Most guitar teachers fail to focus on all 7 elements. In addition to learning what these are (and how to use them with your students) you also need to integrate them together. If you know anything about me, then you know I have a great track record in getting huge and lasting results for my guitar students (you can easily verify this yourself by watching and listening to many of my students who are now excellent guitar players. I don't mention this to brag, I do so to impress upon you that I really do know exactly what you need to do in order to get big results for your students. If you should teach songs or not. A LOT of mediocre guitar teachers focus on teaching their students songs. Fact is, doing so won't help your students to become the guitar players they want to become because they get sidetracked by those specific songs and never truly get enabled to creating their own music etc. Learn how to incorporate songs into your lessons in a way that is not damaging your students' development. How to teach someone who doesn’t ‘get it’ no matter how many times you review the same thing with them. Not knowing how to deal with a student who simply doesn't seem to "get" something you are teaching them can be one of the most frustrating things any guitar teacher has to deal with. This frustration can push you as far as not wanting to teach this person anymore as well as the student giving up. I will show you how successful guitar teachers deal with this problem so that you can approach such situations in new ways that will help both you and your students finally solve this killer problem. How to avoid bad habits in your students' guitar playing and how to fix bad habits if your guitar students already have them. Not knowing when to deal with avoiding or breaking students' bad habits is a very common problem that many guitar teachers struggle with. You will learn what to do and WHEN to do it. Hint: Most of the time, fixing all of your student's bad habits is NOT the first thing you should focus on. Learn about the very best guitar teaching method to use when teaching your guitar students. The traditional 'linear' guitar teaching model you typically see with untrained and struggling guitar teachers is not the model you want to use to teach your guitar students. Your students deserve only the best, I'm sure you agree :) The key to effective and successful guitar teaching is to use the Geometric Guitar Teaching Method™. Your students will love it, learn faster and stay with you longer. Discover Insider Secrets of Successful Guitar Teachers and earn more money working less hours through innovative and powerful teaching models. Get step by step teaching and business templates that will eliminate trial and error and enable you to easily get started right away using the right strategies, right methods and right ideas. Find out how to effectively teach guitar and maximize the benefits ALL your guitar students receive from you. Discover how to keep your students inspired, motivated and engaged in the process of learning from you so that they continue to take lessons from you for years to come. Earn 3, 4, or even 5 times more money compared to what typical guitar teachers earn. Learn how to successfully create and teach group classes and rotating formats. Use specific (and proven) group teaching materials, methods and activities (which work even if your students are at different skill levels). The huge results your guitar students will get will make them want to do group classes with you. You will also get constant feedback about your ideas, problems, challenges and goals on the Elite Guitar Teachers Inner Circle Platinum Member Forum. Meet and connect with BOTH highly successful teachers and other like-minded people in the process of growing their guitar teaching skills/businesses. This instant support will help you evaluate opportunities, address challenges and help you to keep moving forward. Stop struggling and begin investing in yourself so that you can become a great guitar teacher, attract more students, keep them learning longer and help them get the big results they are paying you for! You don't want to be one of those guitar teachers that squirms every time somebody asks you what 'guitar teaching' qualifications you have. When someone asks you how you learned to 'teach guitar' do you really want to have to look that person in the eye and say, "I have no guitar teacher training, I was too lazy to invest a few dollars to get it. So instead, I simply take student's money and 'wing it' even though I don't know the best ways to teach guitar". P.S. Remember, you also get an EXCLUSIVE FREE 45 DAYS PLATINUM MEMBERSHIP OF MY ELITE GUITAR TEACHERS INNER CIRCLE!